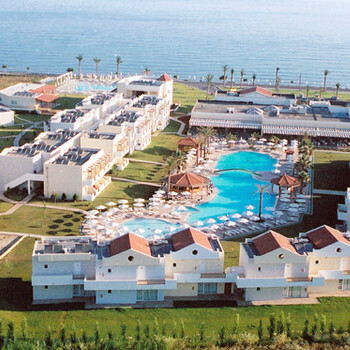 Just got back from a brilliant holiday at Zorbas Beach Hotel. Beautiful hotel and well worth its 5 star rating. Perfect location on beach front but no need to go as plenty sunbeds by the pool. Food all looked good but full of spices and odd concocsions they catered more for german guests lived on chips, salad and cakes for 2 weeks. Entertainment was Chico all day and night really funny guy made us laugh loads made the holiday. It got avit repetative towards the end but he really does try there are only 3 of them on the entertainment team. Walk into Tigiki only took 20minutes very easy walk straight road from hotel a few shops to but gifts but mostly bars and restaurants. Kos town only 1.80 Euros one way by bus from hotel thats a nice harbour town but again full of bars, some good gift shops in old town but makes sure you haggle for things as they are abit pricey. Overall would definatley reccomend this hotel to everyone would go back definatley . Weather 37 - 45 the whole time be careful of the mosquitos they are out in their hundreds as it is so hot take plenty protection cream if you run out onsite shop sells it. Zorbas Beach Hotel is a good 20 minutes walk (about 1 mile)from Tigaki town, along a dark, narrow, deserted, seafront road (street lighting being installed this summer). Bus service (E1.40 each way) to town or Kos stops outside hotel, & taxi into Tigaki is about E5. Hotel is spotlessly clean, although the early morning rumble of the large laundry & cleaners trolleys did tend to disturb our slumbers some mornings. Our room (714) was certainly large enough for the 2 of us, with a double bed & another single bed which could be sectioned off by use of built-in room divider. Plenty of storage space for clothes, although large suitcases may not be so easy to store when emptied. Fridge, kettle, & aircon all worked well. Plenty of hot water for bath/shower anytime. The pool area was well laid out, although the swim-up bar was not in service during our stay (no problem - use the poolside bar opposite). No need for the 6am sunbed shuffle either, always seemed to be enough for everyone (even at the pool edge), & we never had a problem finding beds near "our end" of the pool. If you want to use the Hotels nearby beach, beware that it will cost you E3 for sunbed (even if you're A/I). The food was okay, nothing to write home about, mostly catering for the UK & German tourists, with the odd inclusion of Greek dishes. Plenty of it though - and breakfast available until 11am ! The "entertainment" was great for pre-teens, but everyone else suffered Chico from 10am onwards. During our 2 week stay, there was no "local" or authentic Greek entertainment (music or dance), unless you count the background music from the restaurants greek themed night. Overall the staff were efficient, but with one or two exceptions (Christos in the bar, Ola in the restaurant, & the reception staff) most of the staff seemed bored rigid and just doing their jobs robot fashion. Oh yes, there were other nationals there (German, Dutch, French, etc) but all seemed to get on ok. The hotel itself was lovely, very clean and new. Nice sized rooms, really lovely pools and the beach on the doorstep! The only reason I am writing this review is so that people know in advance that the hotel is mainly frequented by German tourists. We were the only people there from any other country. It was not necessarily an issue for us but felt that this should have been mentioned.